Q&A Archives | SantosHuman, Inc.
Q&A with the CEO: What prompted the development of SantosHuman’s predictive human modeling software? In this Q&A, Steve Beck, President & CEO, discusses the genesis of what is now commonly referred to as Santos®. Watch for additional posts like this one in the future. Q: What prompted the development of Santos®? 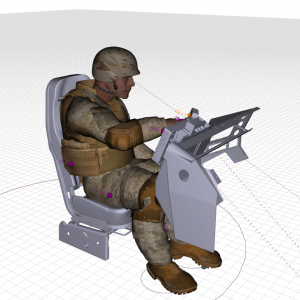 A: The research that led to the human simulation capabilities now commonly referred to as Santos® was originally funded by the United States Army Tank-Automotive and Armaments Command (TACOM) in 2003. 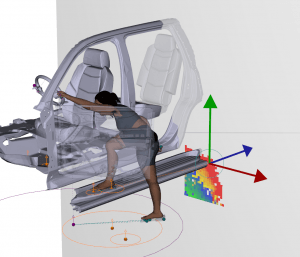 These initial funds were provided to advance research in digital human modeling that could help reduce the time and cost to bring new systems to market. TACOM’s assessment of the digital human modeling tools available at that time was that the capabilities were not sufficient for their future requirements. TACOM’s goal was to “kick start” the development of virtual warfighter-in-the-loop system testing technologies that could decrease the need for physical prototypes and thereby decrease the time and cost to bring new systems into production. The next generation tank was expected to take 13 years from white paper to production. In that time, it was expected that nine working physical prototypes would be created. Each prototype was estimated to cost over $1 billion. Ninety percent of the cost (U.S. taxpayer funds) of each prototype would be committed the minute the DoD said, “cut metal”—in other words, as soon as they committed to having the prototype built. TACOM program managers also relayed that one of the primary reasons for creating these prototypes was to ensure that warfighter-in-the-loop issues were identified and addressed prior to production because failure to do so will cost lives. The ability to assess these types of issues virtually and reduce the number of physical prototypes required represented a significant opportunity to reduce expenditures. Over $50 million (and counting) in external funding has been invested in Santos®-related research and development by the U.S. Department of Defense and private industry since 2003. SantosHuman Inc. is productizing this research to create client-driven Santos® capabilities which now encompass a broad spectrum of Virtual Human-in-the-Loop Solutions for both defense and private industry.